The body of stories that we today call “Norse mythology” formed one of the centerpieces of the pagan Norse religion. These are the tales that Viking poets recited in dimly lit halls to the captivated attendees of grand feasts, and which fathers and mothers told to their children around roaring hearth-fires on long winter nights. They are epic myths of war, magic, love, betrayal, triumph, and ruin. Not only did they provide deep wells of religious meaning for the Vikings; they also speak to much that is timeless and universal in the human condition, and so continue to provide modern audiences from around the world with wonder, entertainment, and even spiritual nourishment for some. The chronology of Norse mythology has a clear beginning in the creation myth, and a clear ending in the tale of Ragnarok. But most of what happens in between those two bookends doesn’t occur in any particular order, and certainly doesn’t follow a strictly linear trajectory. Sometimes, we find that myth A assumes that myth B has already taken place, yet myth B assumes that myth A has already taken place. This is because Norse mythology was never a neat, tidy system; the Viking mind didn’t demand the same kind of strict, rational codification that the modern mind does (or at least thinks it does). Instead, the Vikings seem to have been much more concerned with how much the myths spoke to their hearts and imaginations, as well as the degree to which the myths reflected and made sense of the world as they experienced it. In other words, they were more interested in the stories’ existential significance than in fitting them into a doctrinally and chronologically precise framework. • The Creation of the Cosmos – Fire and ice cross a void, meet in the middle, and form a giant whom the gods then slay to fashion the world. • The Creation of the First Humans – The gods find two pieces of driftwood on the shore in the newly-created world, and bring them to life as the first man and woman. • The Aesir-Vanir War – The two tribes of gods fight the first war that was ever fought. • The Mead of Poetry – After a series of wild adventures and close calls, Odin obtains the mead that grants creative and spiritual inspiration. • The Creation of Thor’s Hammer – Loki stirs up mischief among the dwarves and almost loses his head, but ultimately gives the gods several priceless gifts, including Thor’s mighty hammer. • The Fortification of Asgard – A giant agrees to build a much-needed wall around the gods’ celestial stronghold, but his price is terrible. Loki saves the gods through a scandalously lewd act. • Why Odin is One-Eyed – Odin voluntarily gives up one of his eyes in exchange for one of the greatest prizes in the universe. • Odin’s Discovery of the Runes – After “sacrificing himself to himself,” Odin gains fearsome magical powers. 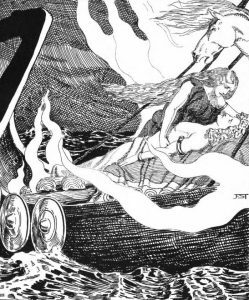 • The Kidnapping of Idun – As a result of further mischief from Loki, the gods almost lose one of their most beloved companions. 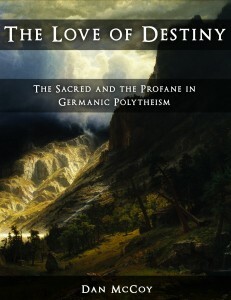 • The Marriage of Njord and Skadi – A god and a giantess suffer an ill-fated marriage. • The Binding of Fenrir – The wolf Fenrir, one of Loki’s dreadful children, is finally subdued, but only after the god Tyr loses something very dear to him. • The Tale of Utgarda-Loki – Thor and Loki travel to the land of the giants and engage their hosts in a series of contests. • Thor Fishing for Jormungand – Thor tries to pull his arch enemy, the “world serpent,” out of the depths of the ocean. • Thor the Transvestite – Thor loses his hammer to the giants, and has to go through a humiliating ordeal in order to get it back. • Thor’s Duel with Hrungnir – Thor duels with one of the most formidable giants. • The Death of Baldur – Baldur, one of the most cherished gods, dies an improbable death through the wickedness of Loki. • Loki Bound – Loki is punished in a particularly agonizing way for his murder of Baldur. • Ragnarok – The gods meet the giants for the final battle that will save or doom the world. Looking for more great stories from Norse mythology? 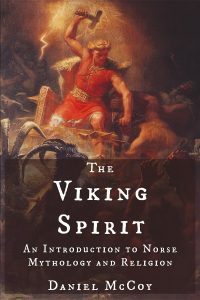 My book The Viking Spirit retells no less than thirty-four of them – more than any other book in the field – while also providing an equally in-depth look at the wider religion of which Norse mythology was a part. I’ve also written a popular list of The 10 Best Norse Mythology Books, which you’ll probably find helpful in your pursuit.